Bleeding a radiator is a fairly straight forward DIY job but there are a few things to consider before you begin. Are your radiators warm at the bottom but cold at the top? This is usually due to air in the system. It most commonly happens after you've had the heating off for lengthy periods. If you've got some air in your heating system it will work it's way around and eventually get lodged in the very top section of some radiators. They will feel warm at the bottom but quit cool at the top. If you live in a home with several floors it's usually the top floors that suffer the most as the air eventually works it's way to the top. You might notice the top floors rooms feel cooler than below as they don't come up to full temperature due to the trapped air. Use a radiator key to "bleed" the air out. The solution is very straightforward. 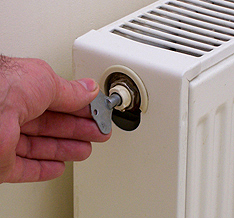 You'll need to buy a radiator bleed key which are readily available at most DIY stores and don't cost much at all. The bleed point is at the top on one side of the radiator. Put the key in and gently turn a quarter turn anticlockwise. Unscrew the bleed screw just enough so you hear air hiss out. The hissing sound shows that there is air trapped inside. When all the air has been released some water should then start to come out. Get ready to quickly tighten it up as soon as water starts to come out. I like to have some kitchen towel handy to catch any water as it tends to be a dirty brown colour and might mark the carpet. The radiator should feel warm at the top now. If your heating is either 1. A combi boiler, or, 2. A high pressure system, then bleeding will reduce the pressure and may stop it working. You will need to repressurise the system. Theses two types of heating have a water top up valve. In bleeding the air out of a radiator you have reduced the pressure. Opening the water top up valve returns the the pressure to normal. If your heating is a gravity sysytem (a cold water feed tank in the loft(or up high) and a hot water cylinder) then you don't need to worry about repressurising because gravity sytems work on low pressure, and the system will top itself up.